Vaalia Lélek L’essence is a line of completely natural, non-toxic skin care products that are handcrafted with essential oils. The chemical make-up of essential oils is responsible for their highly therapeutic effects on the body both topically and internally. Like it or not, what you put on your skin gets absorbed into the body. 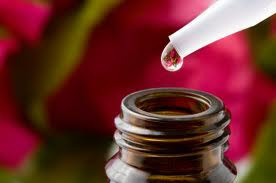 By their very nature, all essential oils are anti-bacterial, anti-viral and anti-fungal! So if you have oily/acne prone skin, sensitive skin like I do, you can absolutely feel good about putting natural oils on your skin! Because the oils are natural substances they tend to go only where they are needed, and provide only the action needed to help restore the body’s natural balance. By eliminating synthetic chemicals, which disrupt the body’s natural balance, and utilizing the intelligence of plants we can restore the body’s natural balance and feed the skin while providing constituents that facilitate healing and restoration. Here are some products from the line that are great for all skin types, especially sensitive / oily and acne prone skin. Made with essential oil of Thyme in Jojoba Oil. It's very gentle and deeply cleansing for acne prone or sensitive skin. Oil-based cleansers are gently purifying & cleansing without disrupting the skin’s natural balance or clogging the pores. Made with essential oils of Sea Buckthorn Berry & Neroli in Jojoba Oil. Contains vitamins C, A, B1, B2 & E. This serum is very high in antioxidants, proteins, minerals and essential fatty acids. It's great for firming, revitalizing, strengthening, reducing scars, improving elasticity, combating wrinkles and fine lines, cell regenerating, evening out skin tone, nourishing, moisturizing, healing all while soothing and cleansing. You can visit their website at: http://vaalialelek.com/.